Infotone Face Mist Review and Giveaway! So, just a few days ago I wrote about my transition to a 100% natural skin care regime. And my Infotone Face Mist has become a big part of my daily skin care ritual. I started using the Infotone Face Mist about 10-12 weeks ago. A friend of mine who works for an advertising agency asked me if I’d like to give it a look. It was eco-friendly (because it can be reused so many times) and 100% natural. She’d been using it for months, and was thrilled with the way her skin was looking. I was intrigued, and said yes. To be clear, I recieved two bottles of Infotone from the company to try for this review. When I first got it, I have to admit I was skeptical. I mean, it’s a jar of water with a ceramic ball inside. My first thought was that this was a gimmick. I mean, it just looks like one, you know? Were people really going to pay $34.95 for a jar of water and a ceramic ball? On the other hand, my friend had never sent me anything bad. She loved the stuff. So, I decided to give it a try. I’ll tell you this now: it’s not a gimmick. The stuff works. Within 2-3 weeks I began to notice some real changes in my skin. The overall tone looked better, the redness around my acne disappeared, and the fine wrinkles around my eyes seemed less noticeable. Not a lot, but a bit. Now, the changes were slow and subtle, but after using this stuff for several months (and beginning my other natural skin care regime a few weeks ago) I’m definitely seeing positive changes. My face just looks healthier. 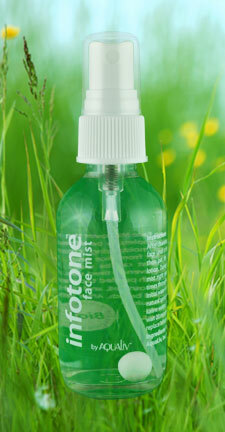 Infotone Face Mist is meant to be sprayed in your face after cleansing, and before moisturizing. You spray it on until it beads, wait a few minutes, and then pat dry. I usually just leave mine on the entire time. The company is a bit secretive about how Infotone really works. They do say that the little ceramic ball in Infotone uses their BioT Bioinformation Technology, which enhances the water with several skin activating compounds (like Squalene, Phytoncide, and Vitamin C). What happens? Well, after using it several weeks your skin starts to glow and look healthier. It’s more hydrated and less dry, pigmentation is better, acne heals quicker, and it’s more firm and supple. Now, all of those changes didn’t happen to me. I’d imagine it’s a bit different for everyone. But I did notice my skin looked less “ashy” from the long winter. The fine lines around my eyes seemed a bit less noticeable. And my acne did seem to be healing quicker. I’ve only been using Infotone in the mornings, however. I imagine if I used it during the afternoon, and in the evening as well, I might see more results. Infotone is also designed to eliminate two common skin parasites, Demodex folliculorum and brevis skin mites (present in 50% of adult and 67% of the elderly), that is often responsible for blemishes and irritated skin. What I like best about this product is that you can reuse it. Once you’ve sprayed out all the water you simply refill it will pure, oxidized water (from approved sources, which you can find on their site here) and wait 20 minutes. Then, Infotone is ready to use again. You can keep refilling and reusing Infotone for one year. Want to try Infotone for yourself? The company has kindly agreed to give 5 Winners a free bottle of Infotone! Whoo-HOO! 1. Contest Will Run from Tuesday, 3/22 through Friday, 3/25. 2. To Enter, simply leave a comment on this post saying why you’d like to win a bottle of Infotone. 3. On Monday, 3/28, I’ll randomly pick 5 winners using Random.org. I’d like to win a bottle to give it a try!!! Pick me! I currently don’t have a skin care regime (I know, baaaad), and I’d love to give a green regime a shot! I would like Infotone as I am in the processing of greening my skin routine too and having another good, natural product would be great! I would like Infotone as I am also in the process of greening my skin care routine and adding another good and natural product would be great! Green eco-friendly skin products that actually make a difference on your skin?… Well, I would like to try it out! I love trying new products..this one looks interesting! I would love to win Infotone because it is natural, the winter is ending and I just turned 39, so my face could really use a boost! Thanks for the review and contest! I would love to win. My face needs something to make it feel better. I have some kind of acne going on too and in my old age need help. 🙂 I want to use something GOOD for my skin, not just a bunch of chemicals. Thanks! I would love to give it a try. I am pregnant and I get awful breakouts. I am very picky what I use on my skin. In High school I did a report on different moisturizers and the ingredients in them. The ONLY one which did not cause parasites, cancer, built up toxins etc was Aubrey Organics. I still use their products and I know today their are many other good options available. I like the fact that this mist works on the bacteria in a natural way. I think it would help my skin issues. I’d love to try it because I have a dear friend with skin problems and she can’t afford Mario Badescu any more! Pick me! 🙂 I honestly think I have tried almost ever natural skin product out there, and this sounds very original (to say the least). Regardless of if I win or not, this sounds like I product I would like to get my hands on! I’d love to try this…my skin has been looking a bit, well, lumpy and bumpy. I wonder if this could help! I’d like to win a bottle to give it a try! The product that I currently use has been working for years, but I think my face might be getting a little to use to it, because every now and then i am breaking out. I never broke out in high school, dont want to start now right before I turn the “BIG 3-0”! Count me in, would love to give it a try. By the way I love your articles! I would love to give Infotone a try. My skin’s fairly sensitive — turns red SUPER easily — but after the long winter it could definitely use some rejuvenation. This sounds really refreshing. Skeptical, but curious. I’d like to try it! My middle-aged skin needs something gentle and effective to perk it up. I would love to win some. I’m just starting to understand the importance of organic products and what it means to use them. I would like to win because there aren’t many products I can use on my face because I am allergic to most. Maybe this one is the one for me! I am a true greenie and would love to win a truly green product Infotone Face Mist! I would LOVE to win me some infotone! I am a mother of a 11 month old and I’m 7 weeks pregnant with my second baby. My skin is already showing the effects of my sleepless-ness. Do help, please. Sounds interesting, I’d like to try it! I’m a mid-fifties person who would like to give this product a try. As a boomer who came of age in an earth-friendly era, it is thrilling to see today’s focus once again on living green with much more intelligence than we had back then. Makes me proud of our two generations that have followed the boomers! I have recently (past 2 months) committed to renew and renovate my lifestyle…have detoxed (6 week program), started an exercise regimine, and “organic-ed up” my skincare and dietary program. Would love to try this! I would love to try anything that is green that’ll help my skin out. As a teenager I never dealt with blemishes or acne, but as a young adult I seem to break out every other week and produce more oil and redness than I ever imagined. Sounds like a real find. I’m really skeptical about stuff like this but love how all natural it is as I am slowly switching my life to all things better for the environment. I’d love to give it a try, all your other recommendations have been the best, so thanks! I’ve been looking for a product that will won’t irritate my skin, this sounds like it would be perfect! We have tried everything for my daughters occasional acne, we were advised to use Aveene water due to its healing properties, well no such luck. Very intrigued by your concept! I am a redhead with sensitive skin and I frequently suffer from Rosacea. I would dearly love to try this product! Hope I am one of the lucky ones! Thanks! I would love to win. Whoo! I would love to try it. I am 29 and I am so tired of having acne. Even when my skin is a little happier my face is all kinds of blotchy. I would really love to win this because I had one (for a few months) and my husband knocked it off the shelf and shattered it!! !